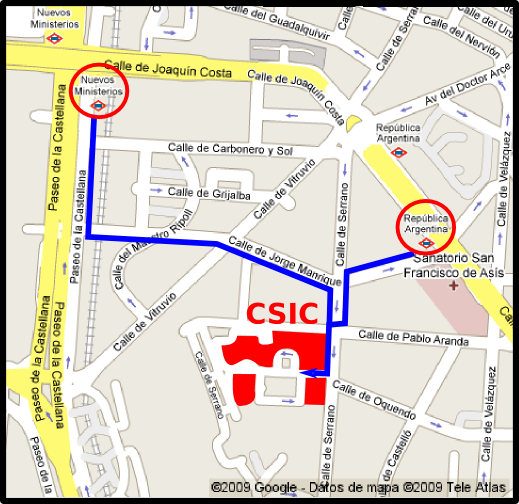 We are at the Building located at Serrano 123 (Madrid) within the Central Campus of Consejo Superior de Investigaciones Científicas (C.S.IC.). This campus is within tthe Embassies' quarter, not far from downtown, ten minutes walking from the Paseo de la Castellana, 30 minutes by Metro from Puerta del Sol (downtown center) and half an hour by taxi from Madrid-Barajas international Airport. Central Campus can be reaches by subway line 6, "Republica Argentina" and "Nuevos Ministerios" stations, as depicted in the map. There are buses to Sol and Callao (51), and Atocha Renfe station (Circular I "CI").